The training will follow a pre-determined structure but will be arranged on an individual basis to suit personal requirements. Owing to the difficulty in obtaining state accreditation, we regret there is little possibility of students obtaining grant assistance at the present time. However the situation may change in the future. Prospective students will be required to attend an informal interview, and may be asked to complete a short written paper. The final stage of the applicant assessment process will involve spending two to three days helping out at the nursery. Each student will have their own special food security project. Students can choose from a wide range of different options. Some examples are given below. Possible projects will be discussed during the interview and also during the two or three days the students are helping out at the nursery. The typical project will be set up as a long term venture but would also be designed to deliver useful information within the 13 month timeframe of the studentship. 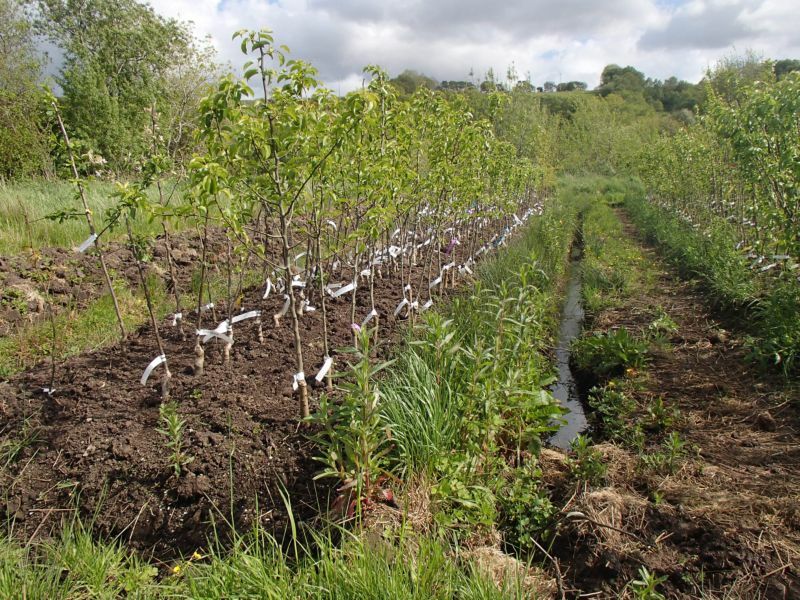 For example, a walnut or heartnut trialling project might involve the establishment of a 5-10 year trial bed but might also focus on the early development of young trees and examine parameters such as annual root growth, susceptibility to climatic and weather factors, and leafing-out times. In particular, there is a lot of scope for projects involving cobnuts, apples, pears, aronia and sea buckthorn as the first trees/bushes planted on site are now beginning to produce regular crops. Here the project would identify areas currently unsuitable for planting trees then formulating and executing a plan of action to rehabilitate the land (for example improving drainage then planting the area in alder). As a control, part of the land would be left in its original state. Here the objective would be to monitor temperature and other climatic factors across different micro-climates on site, leading eventually to the production of site climate maps and better utilisation of the land resource. Within this broad remit, there would be the option of carrying out experimental micro-climate modification through the creation of shelter or enhanced solar heat capture. All on-site student projects will be able to avail of logistical support from the nursery. Image: New ridge created on the flood plain at Cooloughra (November 2014) . Image: The flood of January 2015. The ridge in the previous photo - now a nursery bed for young fruit trees - is to the immediate right of the wide water-filled ditch. The highest point of the flood - about 30cm higher - was during the middle of the night. While this is certainly challenging terrain, parts of this area are gradually being planted in pear, cherry and cobnut trees, mainly on mounds. Image: Terraces above the river March 2015. This is the warmest and most sheltered part of the whole site. The land on the northern part of the site had a 2m depth of stones, clay and subsoil dumped on it about ten years ago (thousands of tonnes in total) and is gradually being colonised by scrub vegetation. Before remedial work began, organic content was close to zero. Copious quantities of organic material have now been mixed in. The stones in the pile above the upper of the two terraces - roughly the volume of a small car - were taken out of the beds as they were worked. Image: New bed under construction, April 2015. 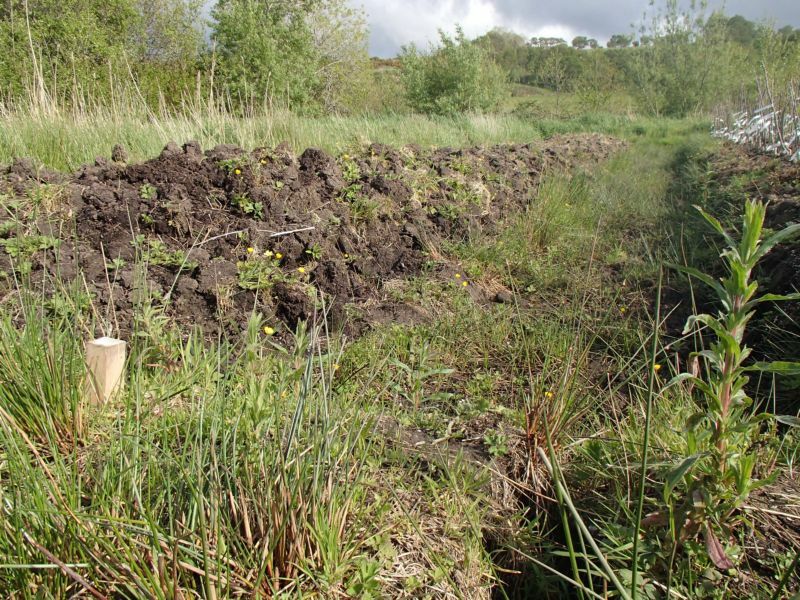 The ridge had been roughly laid out three years previously and was permitted to become colonised by native plants (mainly grasses, rushes and buttercup). The material was a mixture of fibrous peat, silt and clay. However, the raised nature of the ridge allowed it to become more aerated, leading to the decomposition of the more fibrous roots. Three years on, high pressure to the east of Ireland provided the drying conditions necessary to move the project on.. The ridge has been turned over with a spade (well sharpened in advance to facilitate cutting through rushes). Note that the side of the ridge is contained within a barrier of live rushes. The small trench is to facilitate drainage in the space between the ridges (used as an access path). The ridge will be dug a further three to four times within the next few weeks, with ground limestone added between the second and third digs. In the post-crash style of agriculture practiced at Cooloughra, all the native plants are considered to be potentially useful. Rushes are excellent for drying up and aerating wet ground, making humus and also for stabilising the sides of ridges. Cough grass will penetrate the worst clay, helping aerate it and break it up. And the buttercup improves the condition of the top layer of soil, thereby making the ground easier to turn. As the bed is dug and prepared for lining-out fruit trees, the native plants are cleared and thrown into the line of the next bed. In terms of wetness, there is almost no limit to where this style of agriculture can be practised. The wetter the land, the wider the spaces between the ridges and the higher the ridges. Although this field floods in winter, the ridges are sufficiently above the highest 24 hour water level for young fruit trees to flourish. An aesthetically pleasing alternative to long ridges would be islands within the flood plain. To the left of the ridge is another ridge, currently covered over with protective layer of couch grass and rushes. Image: Preliminary work for construction of new ridge, May 2015. The ground had been previously covered with polythene to suppress vegetation. However, the nursery has now phased out the use of polythene for this purpose and from now on will use deep mulches instead. The new ridge will be to the left of the drainage trench. This location is one of the wettest places on the whole site and it is expected the land will take up to three months to dry sufficiently for it to be turned by spade. The initially turning will allow the soil - a mixture of peat, silt and clay - to dry further. As the land dries more, it will be turned again (up to eight or nine times). Previous work of a similar nature at Cooloughra has shown that it is beneficial to let the native plants - primarily reeds, rushes, couch grass and buttercup - regenerate between digs, as the root action will help break up the heavy soil. Also, the digging in of new growth helps enrich the soil. It may be two years before the ridge is ready for planting. Image: Ridge prepared earlier in the year (see April 2015 image above) lined out in trees for growing on (June 2015). The ridge was widened and levelled out prior to planting. The value of having the ridges well above the water table has been very apparent this year. The rainfall for May was the highest for some years. Beds at lower elevation have remained in a soggy state and have been very difficult to prepare. There are some concerns whether the wetter beds will have sufficient soil aeration for the sensitive roots of fruit trees. To the left of the photo is a glimpse of a new bed (see below). In April, this was a mass of reeds and grasses. Image: New bed at first dig stage (June 2015). The raised elevation and steep profile of the bed facilitates drainage and increases aeration. This in turn facilitates the breakdown of old organic matter, some of it (the peaty part) the result of millennia of high rainfall combined with poor natural drainage. The field sits at the lowest part of a glacial depression that thousands of years ago would have held a small lake. As the lake silted up, the depression would have become colonised by trees, including Scots Pine. Changes in the mid-Holocene climate caused the formation of a deep layer of peat. Later still, the peat was buried by silt and clay deposits laid down during major flood events. Working the land provides many clues to the forces that helped shape and form our soils. In understanding these, we are better equipped to make appropriate decisions concerning future land use.